Most ignition key switches have a 'D' shaped body so they don't rotate when you turn the key. However, most people don't have the necessary D-shaped drill bit, so we made this convenient weld-on tab out of 3/16" thick mild steel. 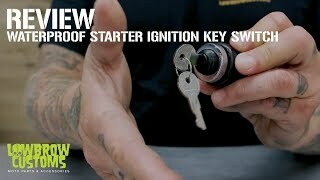 This tab accepts the ever-popular Lowbrow Customs Weatherproof Starter Ignition Switch or any other ignition switch with a 13/16" body. Made in Ohio, USA. Todd - is always great talking me through my build. Top customer service! Perfect! .Nothing Fancy, But One of those Doo Dah's that make a job easy. Nice piece. Perfect fit and a time saver! Looks good and saved me fab time!